I often have to draw concept diagrams and until now I had to use MindMap tools and tools like Visio. And up until now it wasn’t that much fun… but first things first, what’s a Concept Map? 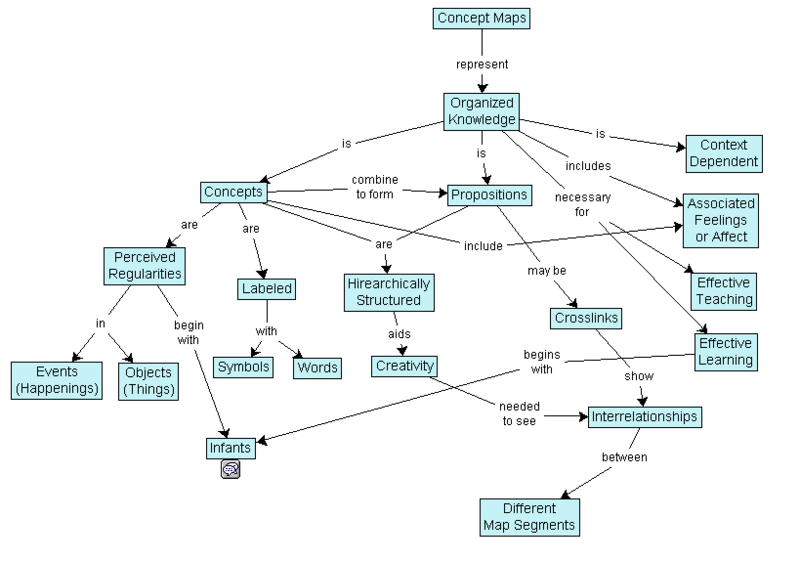 “A concept map is a diagram showing the relationships among concepts. They are graphical tools for organizing and representing knowledge. 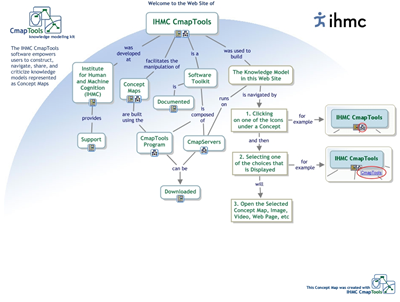 So I found a tool called “IHMC CmapTools” – a great package of software available for Windows, Mac OS X and Linux. 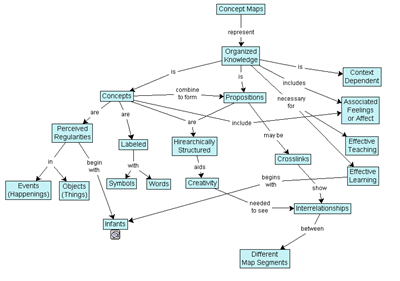 And this tool makes it so much easier to create impressive and expressive concept maps. It’s freeware and can be used even for commercial purposes. 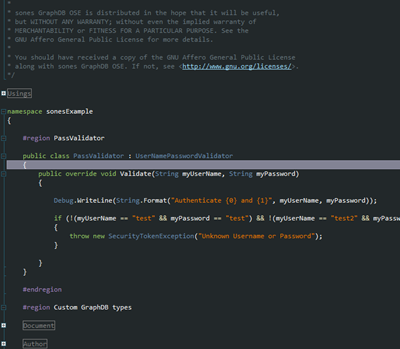 It’s been some time since I’ve written about a Visual Studio Color Theme Generator. And obviously since then a lot happened in the world of customization tools. 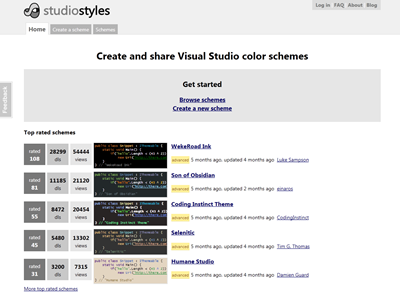 The website studiostyles.info is there to help the day with a lot of previewable Visual Studio styles. 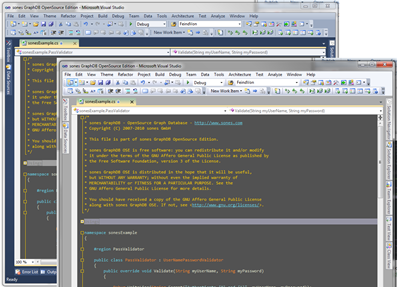 Even better: all styles can be exported for Visual Studio 2005, 2008 and 2010. 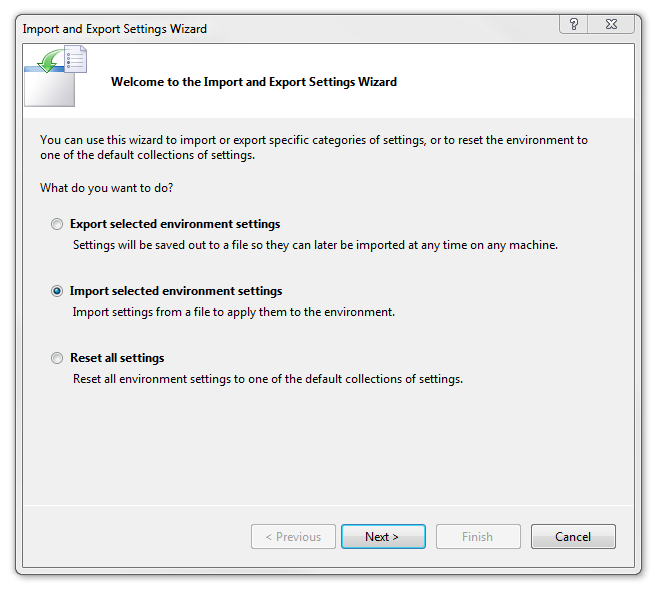 For Visual Studio 2010 you get a .vssettings file which can be imported into Visual Studio using the Tools->Import and Export Settings… menu item. 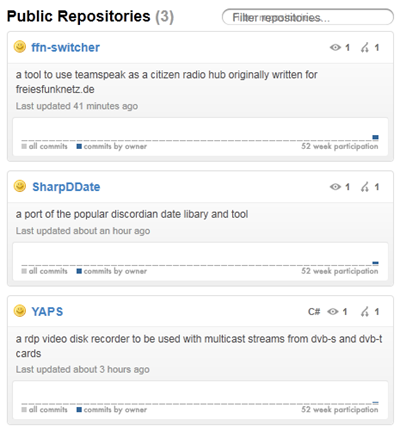 For my own private code I was using a subversion repository for some time now. Since I am using GIT for some time now at sones and the experience so far was great I decided to port all my public projects to github. 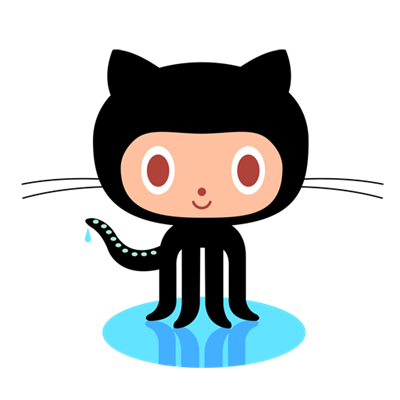 GitHub is a public git service which additionally to the source code management offers a great user interface. Since we’re at it – we not only took the new Mono garbage collector through it’s paces regarding linear scaling but we also made some interesting measurements when it comes to query performance on the two .NET platform alternatives. The same data was used as in the last article about the Mono GC. It’s basically a set of 200.000 nodes which hold between 15 to 25 edges to instances of another type of nodes. One INSERT operation means that the starting node and all edges + connected nodes are inserted at once. 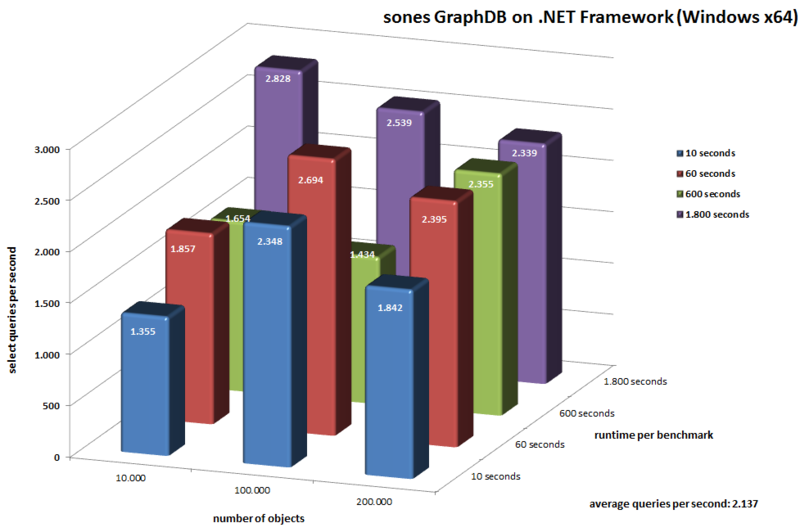 We did not use any bulk loading optimizations – we just fed the sones GraphDB with the INSERT queries. We tested on two platforms – on Windows x64 we used the Microsoft .NET Framework and on Linux x64 we used a current Mono 2.7 build which soon will be replaced by the 2.8 release. After the import was done we started the benchmarking runs. Every run was given a specified time to complete it’s job. The number of queries that were executed within this time window was logged. 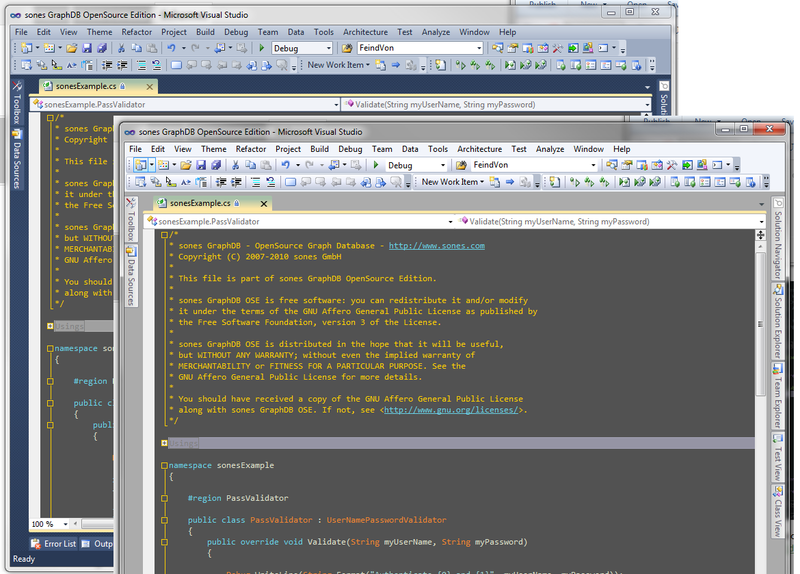 Each run utilized 10 simultaneously querying clients. Each client executed randomly generated queries with pre-specified complexity. Not surprisingly both platforms are almost head-to-head in average import times. While Mono starts way faster than .NET the .NET platform is faster at the end with a larger dataset. We also measured the ram consumption on each platform and it turns out that while Mono takes 17 kbyte per complex insert operation on average the Microsoft .NET Framework only seems to take 11 kbyte per complex insert operation. As you can see on both platforms the sones GraphDB is able to work through more than 2.000 queries per second on average. For the longest running benchmark (1800 seconds) with all the data imported .NET allows us to answer 2.339 queries per second while Mono allows us to answer 1.980 queries per second. With the new generational garbage collector Mono surely made a great leap forward. It’s impressive to see the progress the Mono team was able to make in the last months regarding performance and memory consumption. We’re already considering Mono an important part of our platform strategy – this new garbage collector and benchmark results are showing us that it’s the right thing to do! 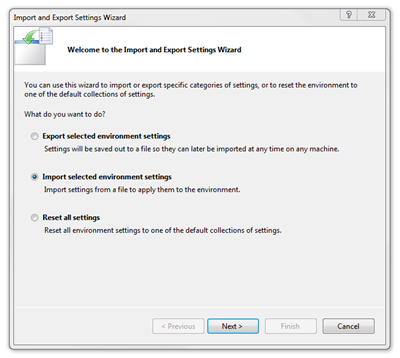 UPDATE: There was a mishap in the “import objects per second” row of the above table. In other words: Mono is the platform which is needed to run the sones GraphDB on any operating system different from Windows. 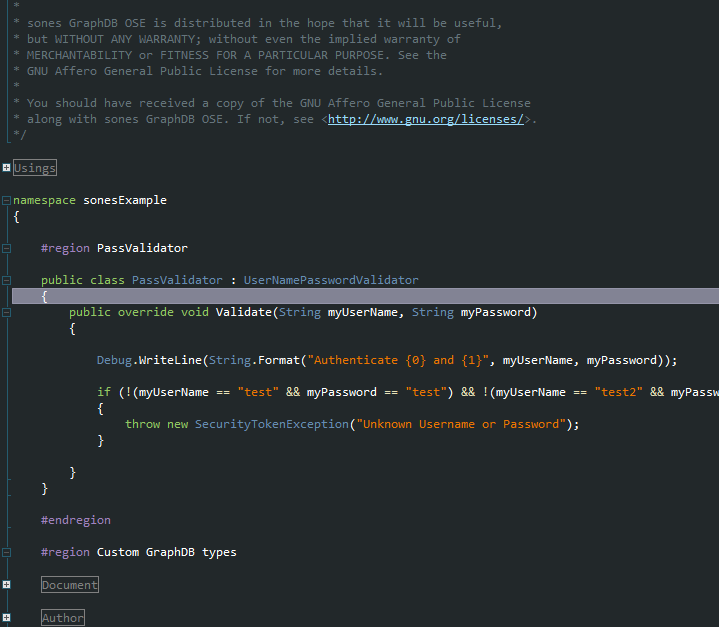 It included the so called “Mono Runtime” which basically is the place where the sones GraphDB “lives” to do it’s work. The Mono runtime has always used a simple garbage collector implementation called “Boehm-Demers-Weiser conservative garbage collector”. This implementation is mainly known for its simplicity. But as more and more data intensive applications, like the sones GraphDB, started to appear this type of garbage collector wasn’t quite up to the job. Two major collectors: Copying and Mark&Sweep. 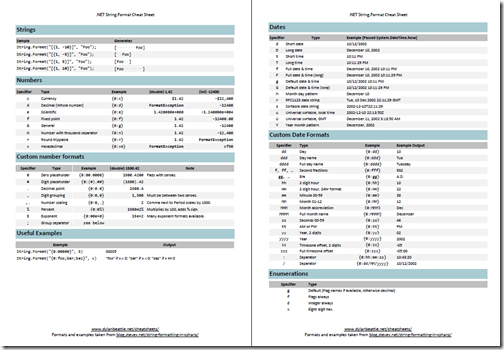 To fully understand what this new garbage collector does you most probably need to read this and take a look inside the mono s-gen garbage collector code. So what we did was taking the old and the new garbage collector and our GraphDB and let them iterate through an automated test which basically runs 200.000 insert queries which result in more than 3.4 million edges between more than 120.000 objects. 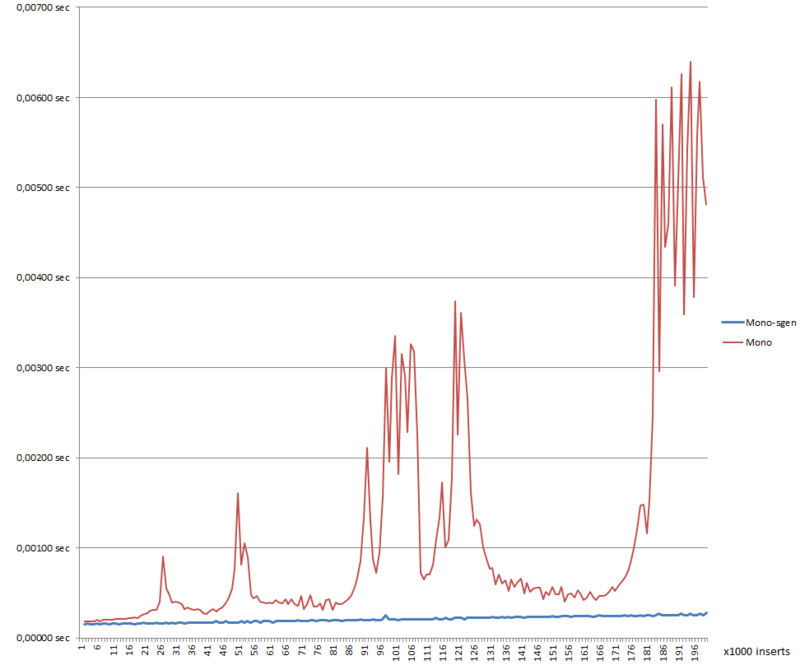 The results were impressive when we compared the old mono garbage collector to the new mono-sgen garbage collector. On the x-axis it’s the number of inserts and on the y-axis it’s the time it takes to answer one query. So it’s a great measurement to see how big actually the impact of the garbage collector is on a complex application like the sones GraphDB. The red curve is the old Boehm-Demers-Weiser conservative garbage collector built into current stable versions of mono. The blue curve is the new SGEN garbage collector which can be used by invoking Mono using the “mono-sgen” command instead of the “mono” command. Since mono-sgen is not included in any stable build yet it’s necessary to build mono from source. We documented how to do that here. So what are we actually seeing in the chart? 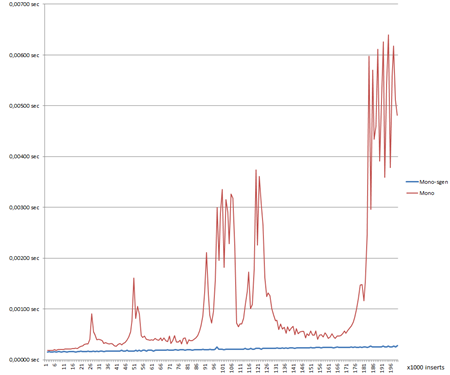 We can see that mono-sgen draws a fairly linear line in comparison to the old mono garbage collector. It’s easy to tell why the blue curve is rising – it’s because the number of objects is growing with each millisecond. The blue line is just what we are expecting from a hard working garbage collector. To our surprise the old garbage collector seems to have problems to cope with the number of objects over time. It spikes several times and in the end it even gets worse by spiking all over the place. That’s what we don’t want to see happening anywhere. The conclusion is that if you are running something that does more than printing out “Hello World” on Mono you surely want to take a look at the new mono-sgen garbage collector. 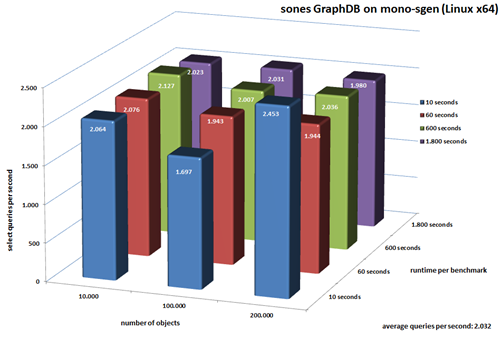 If you’re planning to run the sones GraphDB on Mono we highly recommend to use mono-sgen.